This is super simple and it's the dressing that makes it creamy and delish. In a small bullet type blender, puree about half of one of the cucumbers, a couple onions slices, the half avocado, olive oil, tarragon, salt and pepper until very creamy and smooth. This will take a couple minutes. Slice the rest of the cucumbers and onion and toss with the arugula. Dress and add a few crushed red pepper flakes. Store any leftover dressing in the refrigerator for up to a week. This is perfect to bring to my next family gathering or perhaps Sunday dinner at my parents' house. Thanks for the recipe. I just made this and its INCREDIBLE! 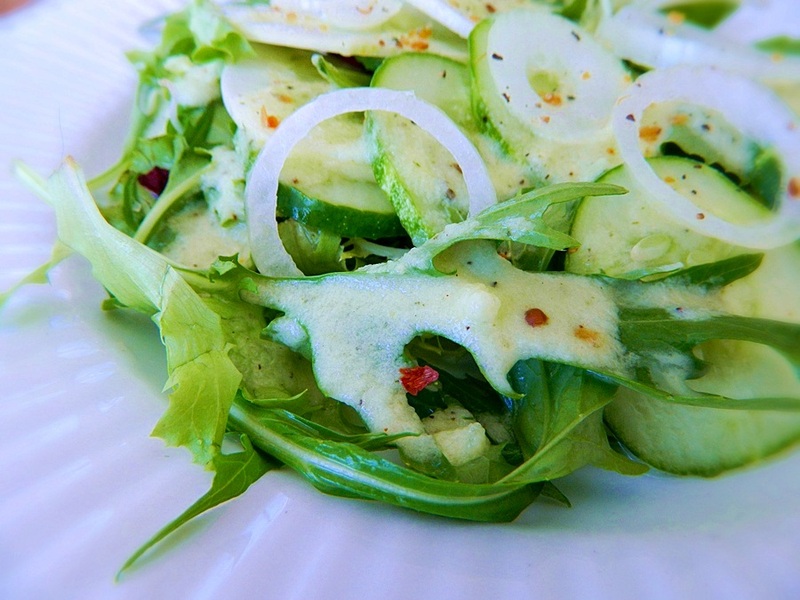 The peppery taste of the arugula and the cukes and onions..and oh my that dressing!! I fixed this last night and of course my young son and I loved it...but my hubby is almost kind of stuck with Ranch dressings...and He LOVED it with capital letters...instead of the pepper flakes(didn't have in my pantry) I sprinkled little bity drops of Sririacha sauce. It's a hit for us.Thanks.